Delphi Mobile Point of Sale Software - Felix John COLIBRI. For Shop management, data is usually centralized in some database, but the shop workers move around the shop and must have access to this database. Wifi is quite adapted to solve this kind of problem. The objective is to display on a tablet the content of one or several table contents. 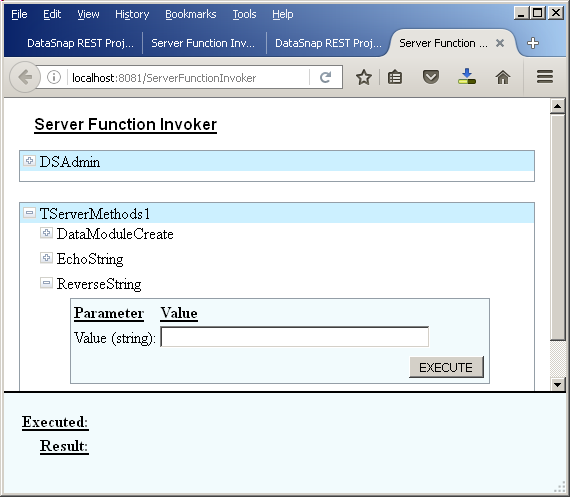 The mobile device will interrogate a Server who which will load the data and send it over to the Client. The Database can be any database. We chose FireBase which is installed in 3 minutes sharp and, according to some surveys, is the most popular database for Delphi users. But you can use Oracle, Sql Server, Postgres, Interbase, MySql etc. To communicate with the Clients, the Server can use any transfer protocol. 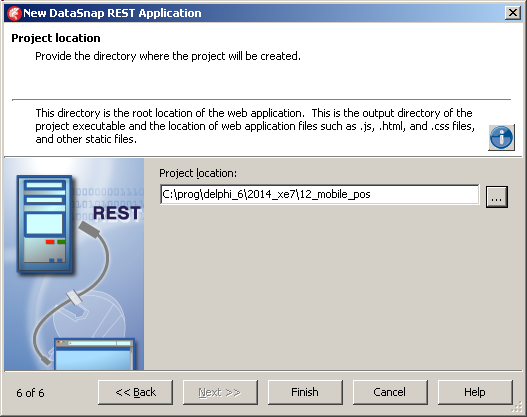 However this protocol must be compatible with the mobile devices, and, in this case, Rest is a good solution. 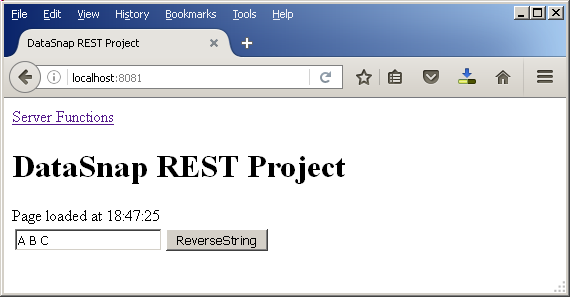 To implement Rest services, a Tcp Server could be used. We would have to handle the marshalling / unmarshalling of the objects ourselves. Here comes JSon, which was just created for this very purpose: transfer objets from one place to the other. 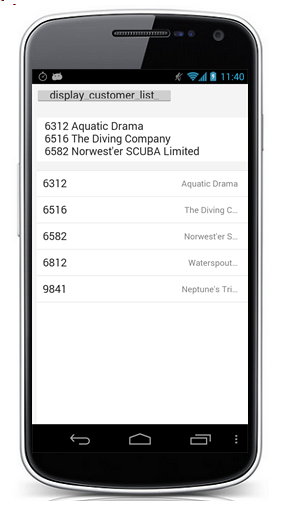 And for JSon, FireDac offers an out of the box library. Finally the Client must be able to request the data. 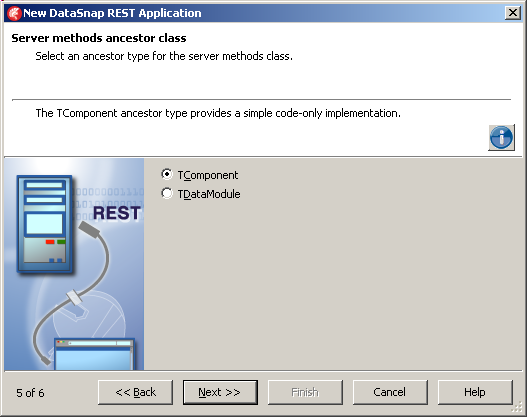 If the data is in the form of objects, DataSnap with methods (function returning objects in our case) can be used. 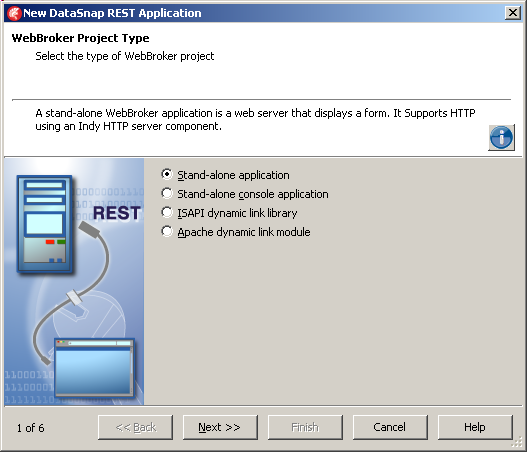 select "Tools | Options" and in "Default Project:", fill the project folder name and click "Ok"
select "File | New Other"
select "DataSnap Rest Application" and click "Ok"
we prefer to use the Indy Tcp Server. 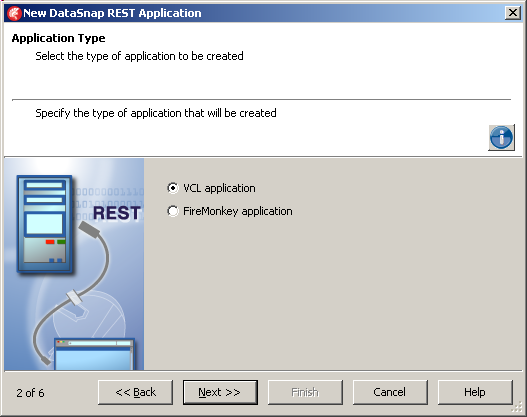 So select "Stand Alone" and click "Next"
Delphi ask us if we want "Vcl" or "FireMonkey"
for the Rest Server, keep "Vcl" selected and click "Next"
in our case, no authentication, and we keep, for this tutorial, the sample DataSnap method (a "reverse string" method). 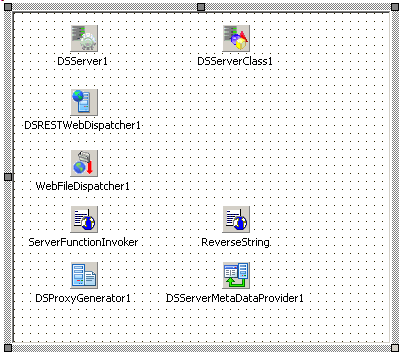 So keep the defaults and click "Next"
select "tDataModule" and click "Next"
navigate to your projects folder and click "Finish"
u_server_methods.pas is a tDataModule containing all the methods the Rest Server will offer to its clients. In Our case, the Wizard has prepared two functions, EchoString and ReverseString. 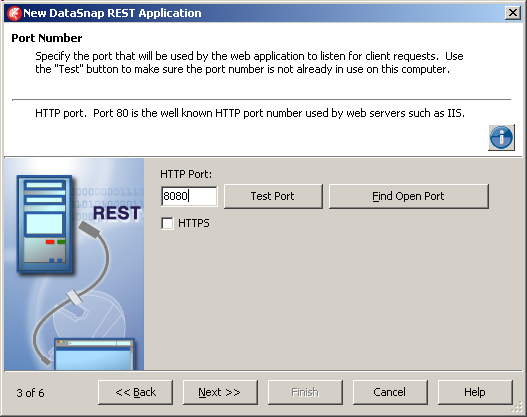 The main form can be used to start the server and open a browser to test all DataSnap methods. the test .HTML pages have been generated by the two tPageProducers which are on the tWebModule. 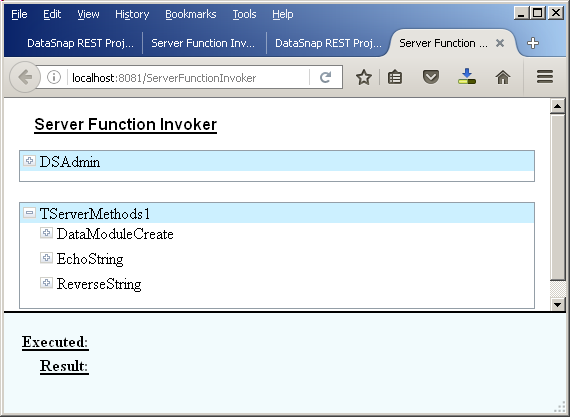 Those .HTML page also use all the css\, images\ js\ and templates\ displayed in the project manager. Those files would not be necessary for a simple REST server. 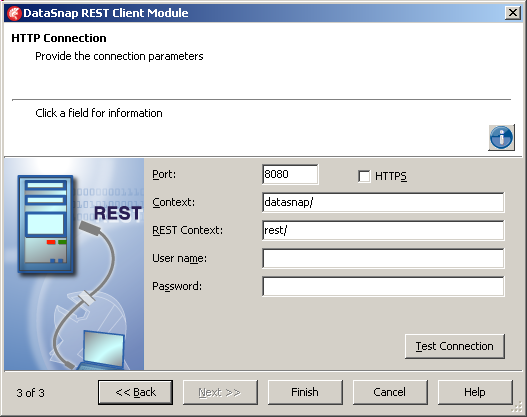 Our Rest Server is going to send the content of some Table to its clients. 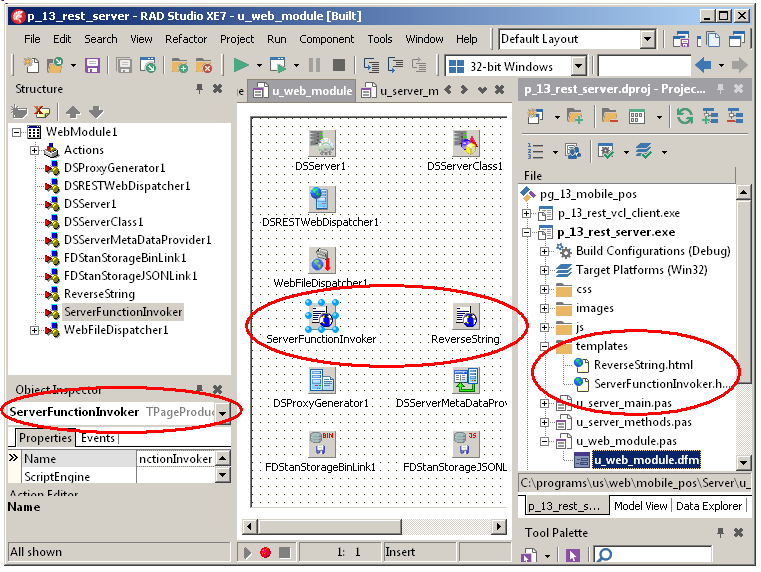 If you select another database, just find 2 or 3 tables with a master / detail relationship. 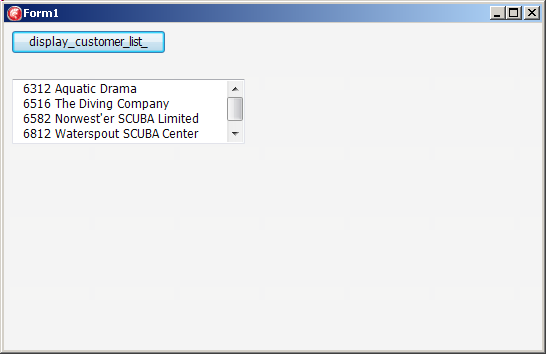 We added the Sql Scripts to allow you to create and fill those tables. 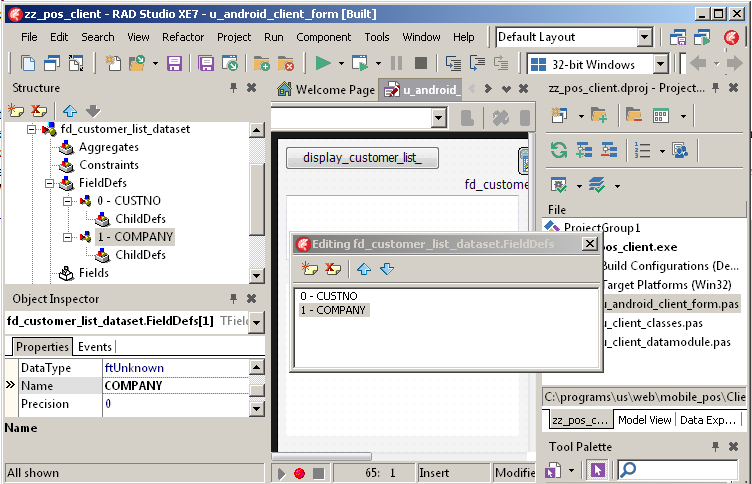 We will start with a client which will display the CUSTOMER ( CUSTNO, COMPANY ) table. 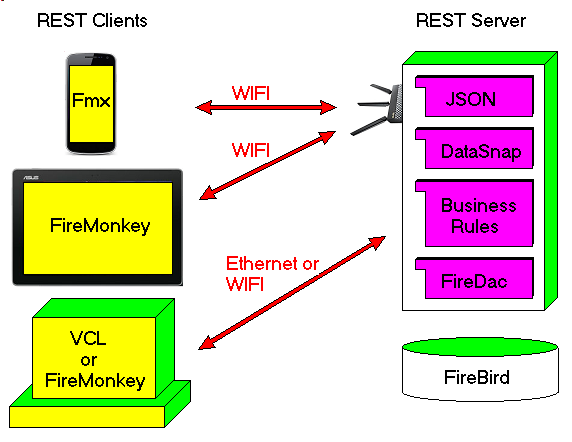 To read and write the tables, we will use FireDac. 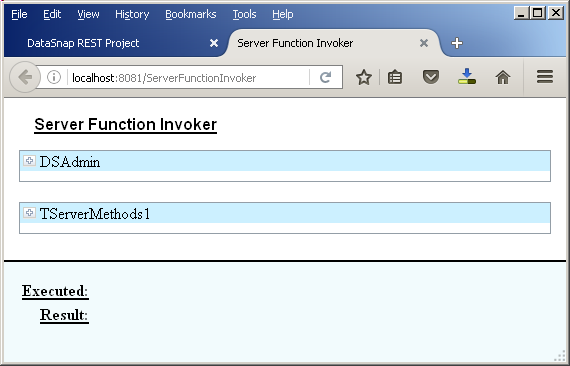 run, start the server, open the browser, click on the function invoker link, open the TServerMethod, click on the "+" before f_test_connection, click "EXECUTE"
The Client will ask for the CUSTOMER dataset. 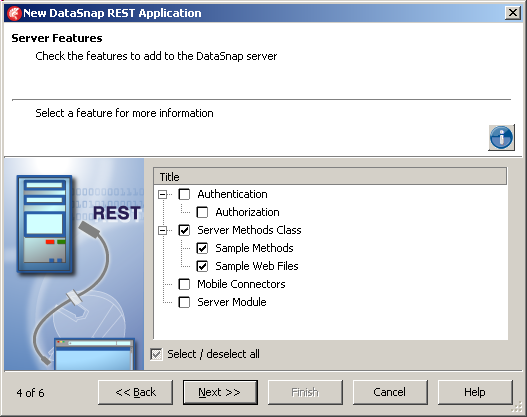 This resource will be sent over as the result of a DataSnap function. 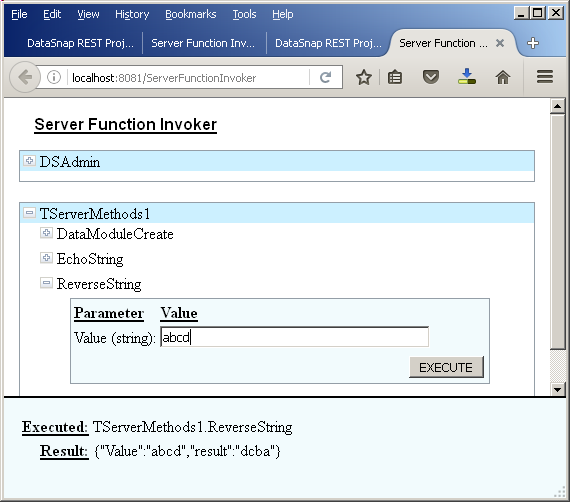 // -- Clear active so that query will reexecute. 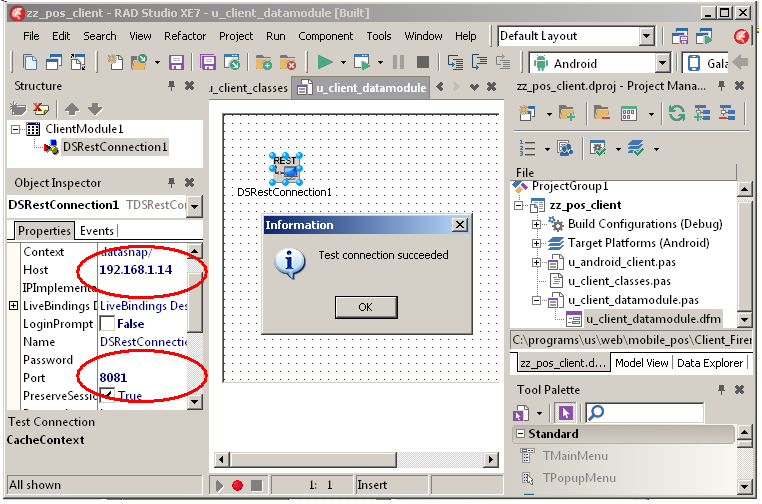 FireDac has a tFDJSONDataSetsWriter Class with a ListAdd Class function. when requested, the writer will convert the queries Answer Sets into the tFDJSONDataSet using RTTI (Reflection, in Java parlance). We will start with a standard Windows VCL Client. 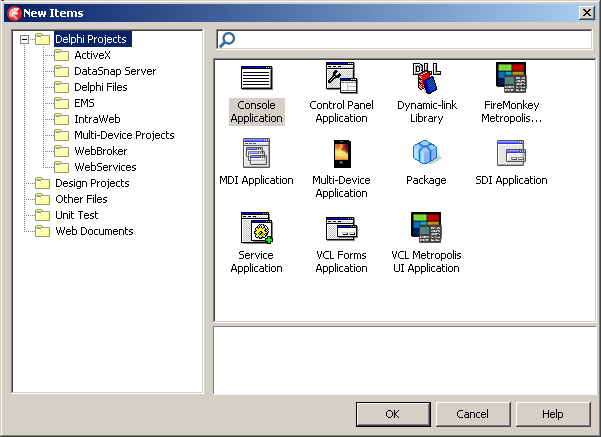 launch Delphi, and select "File | New | Vcl Application"
add the import units by selecting "File | New | Other | DataSnap Server"
select the "DataSnap Rest Client Module" and click "Ok"
for this VCL client located on the same PC, we keep the "Local Server" and click "Next"
we keep the "DataSnap Stand Alone Server" and click "Next"
we change the port to 8081 and click "test"
we click "Ok" and "Finish"
the wizard has created the two import units. 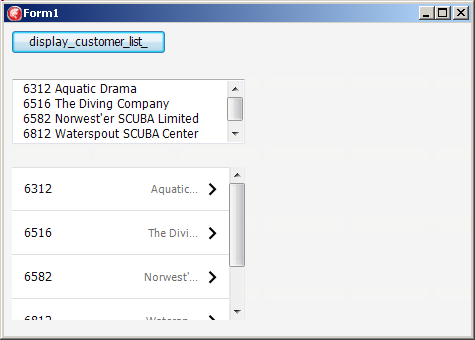 call the f_c_get_customer_name_list Function to fill the dataset. We will now add another Client which will run on a mobile device. We will demonstrate the case with an Android Smartphone (Samsung Nexus), but any other Android phone or tablet, or Apple iPhone or tablet would work, thanks to the "single code base" Delphi principle. This is not a paper about starting with Delphi Mobile programming. 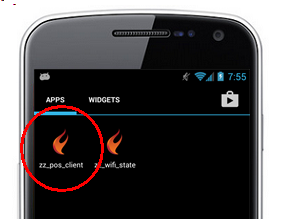 Our smartphone uses WIFI to connect to our DataSnap Rest Server (USB for deployment, but WIFI for execution). 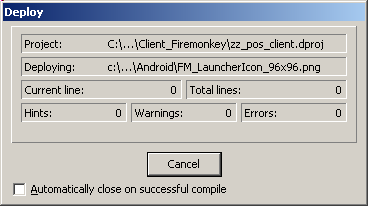 Before diving into the FireMonkey code, it is important to test the connection. 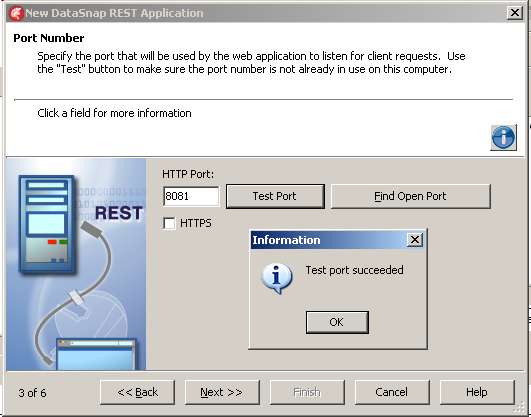 The first thing is to assign a fixed IP, Port to the Server. 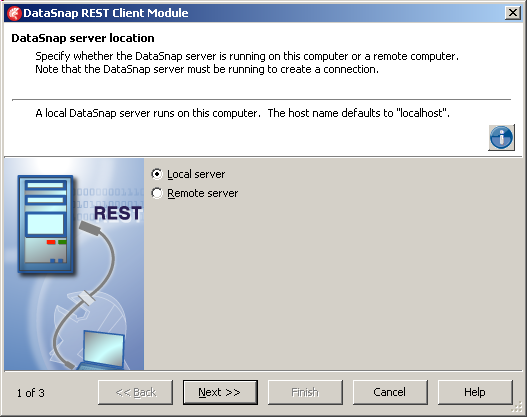 contains a DHCP server which allocates the devices IP. 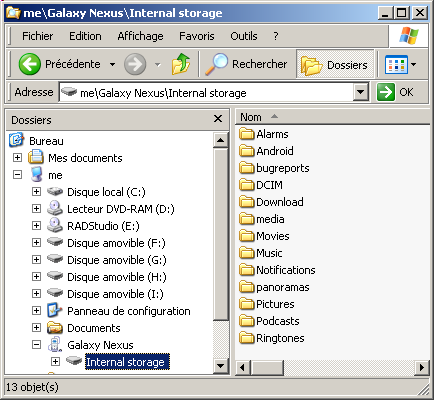 The manager can be used to freeze the IP of one or several connected devices. The other devices are allocated random IPs. So we froze the Server IP, setting its value to 198.168.1.14. 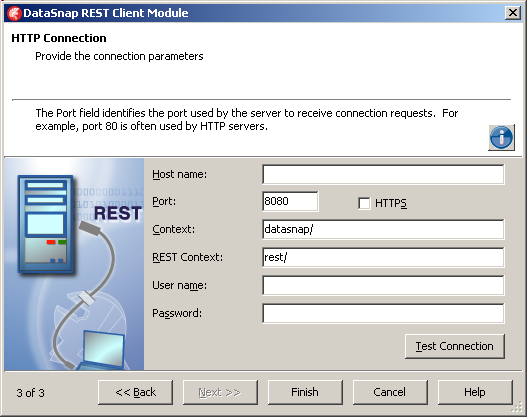 The Port of our REST Server application was set when we created this Server with Delphi. It is 8081. The most important is to be check that the Client can connect to the Server and send some requests. 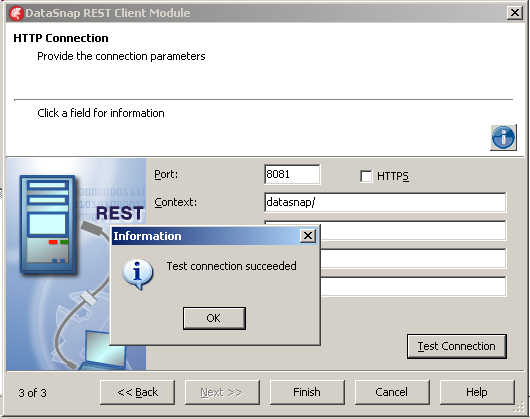 This test was performed using a tIdTcpClient which tries to Connect. First, make sure the Rest Server is running. 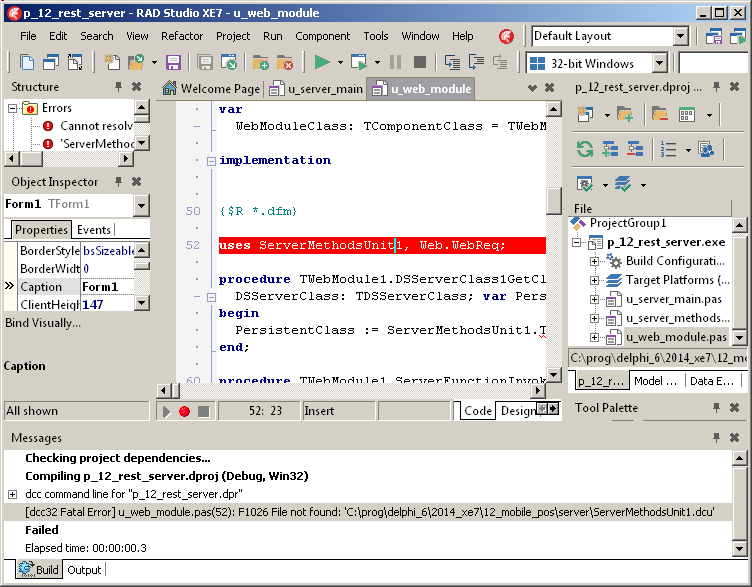 The server will be called by the Delphi IDE to import the classes and method definitions. 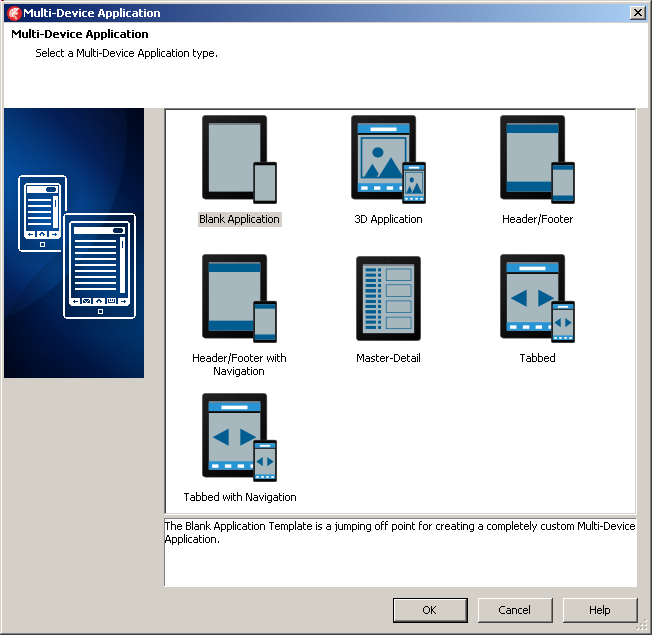 select "File | New | Multi Device Application"
select "Blank Application" and click "Ok"
select the "Views" combo, display the available formats, and select "
the android device asks you to confirm the debug mode : "Allow Usb Debugging ?" the compiler will display "compiling, linking, deploying, stripping symbols, packaging, installing"
If the device is active, you will see our page with Button1. 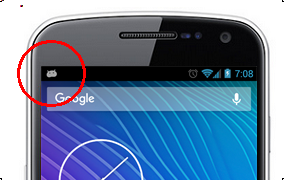 If the phone is in sleep mode, pushing "Power" will display the same thing. 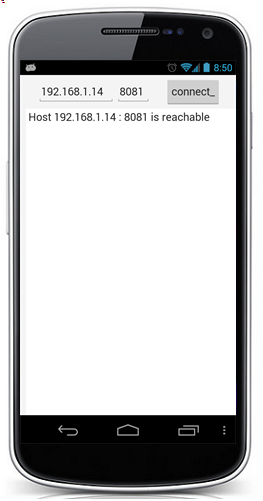 for this FireMonkey client connected by WIFI, select the "Remote Server" and click "Next"
we type the 192.168.1.14 IP and change the port to 8081. 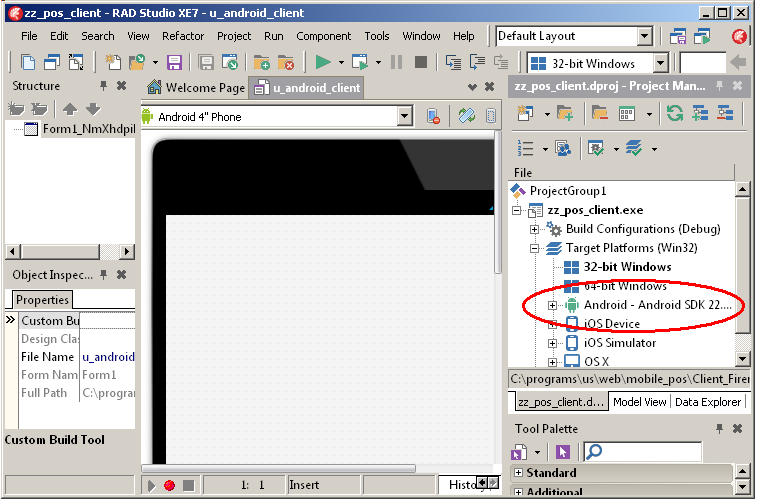 Then click "test"
the Android cross-compilation and Android deployment is rather lengthy. 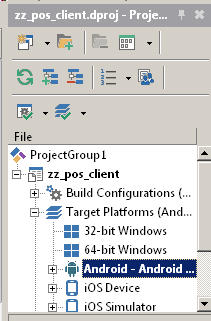 This is the reason we used "Build" rather than "Run"
for the first test, change the platform target to "Windows" ("Project Manager | zz_pos_project | Target Platform"
Note that the form has been displayed in "Windows Format" (not the phone width and height). Our memo display was just to check the fetching. 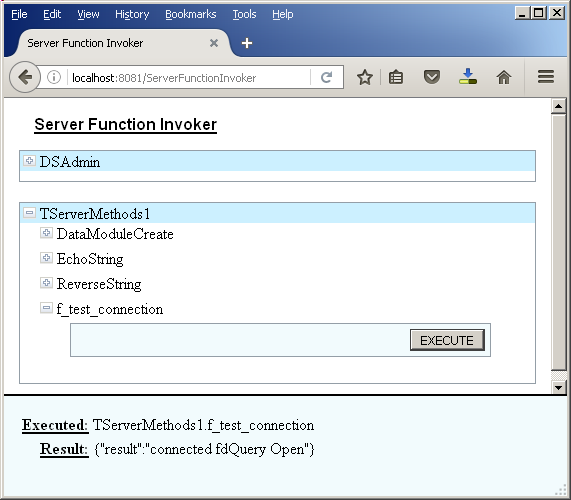 For production applications, we will use FireMonkey controls, and bind them visually to the tFdMemDataSet. 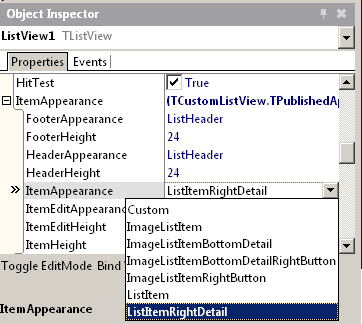 add a tFieldDefs by clicking on the top-left yellow icon "Add New"
select the "Detail" listview, by selecting in the Object Inspector "Listview | ItemAppearance | ListItemRightDetail"
in our Delphi XE7 version, the LiveBindings Designer would not display the tFdMemDataSet fieldefs we just created. Closing the app and reloading it did the trick. Since the syntax is correct, we will now adjust to Android. 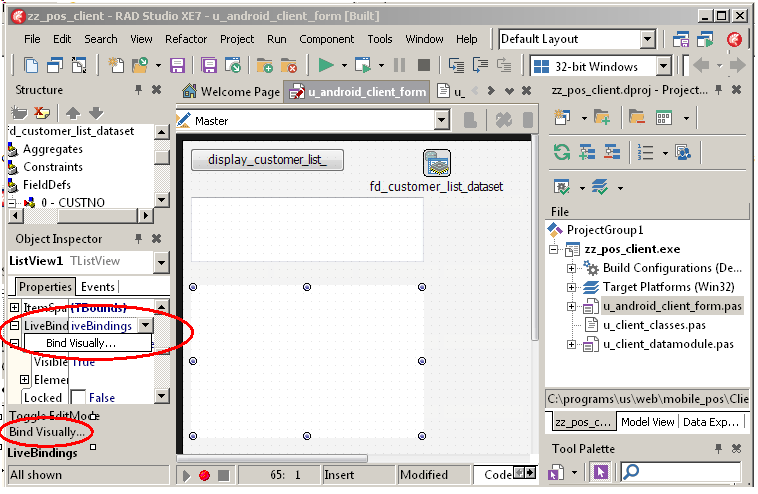 change the Designer view back to "Android 4 inches"
change the Target Platform to "Android"
our display is quite primitive, to say the least. 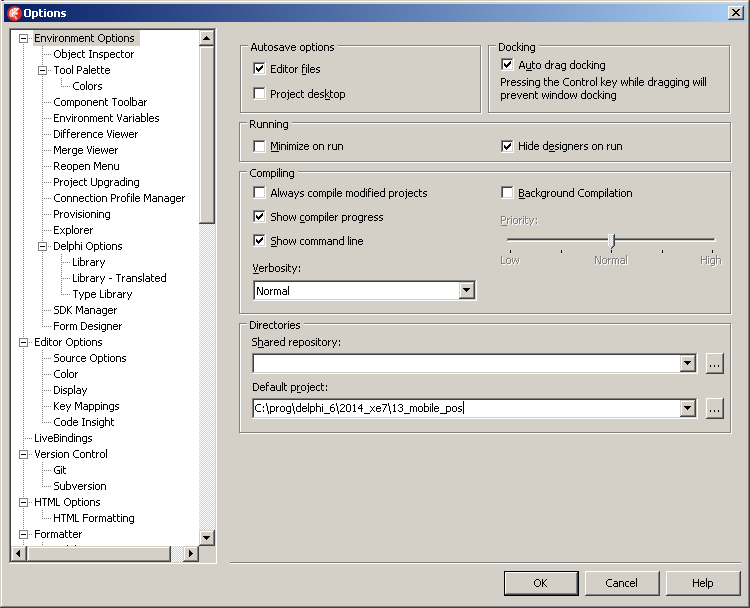 For customer applications, we would resize the controls, add shading, more sophisticated controls etc. if we move the controls in the Master View, the changes are not propagated to the other Views. Each view manages the graphic properties. 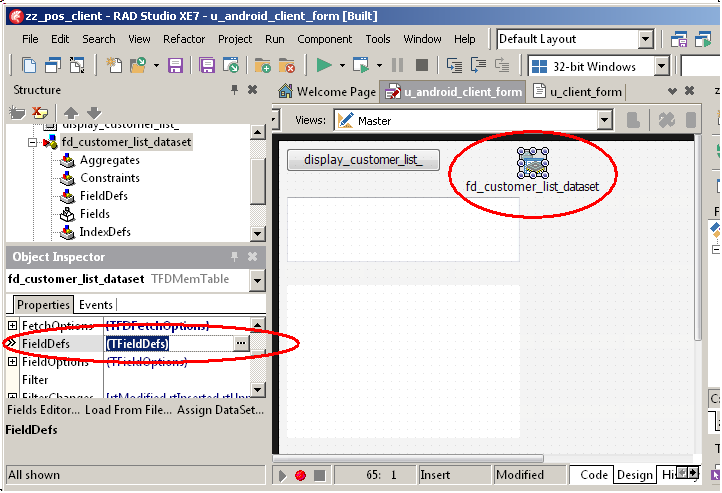 Those properties are saved in a separate .DFM, named called in our case "u_android_client_form.NmXhdpiPh.fmx". 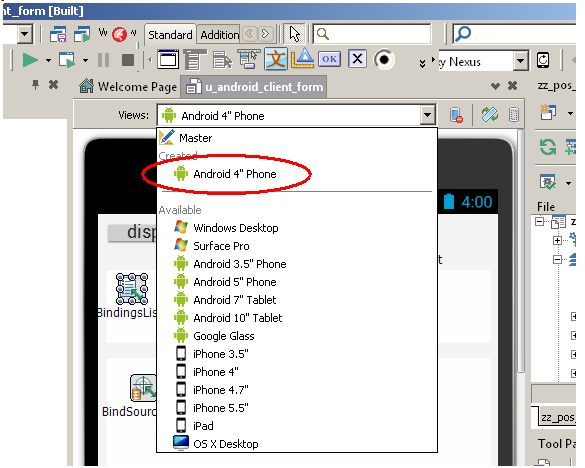 for our first Android trials we used the Windows Target Platform because of round trip speed. 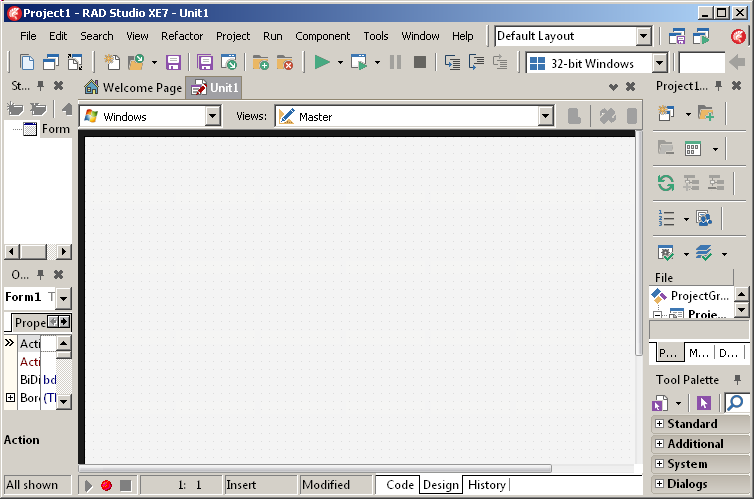 Of course the resulting FireMonkey Windows layout is not adapted. 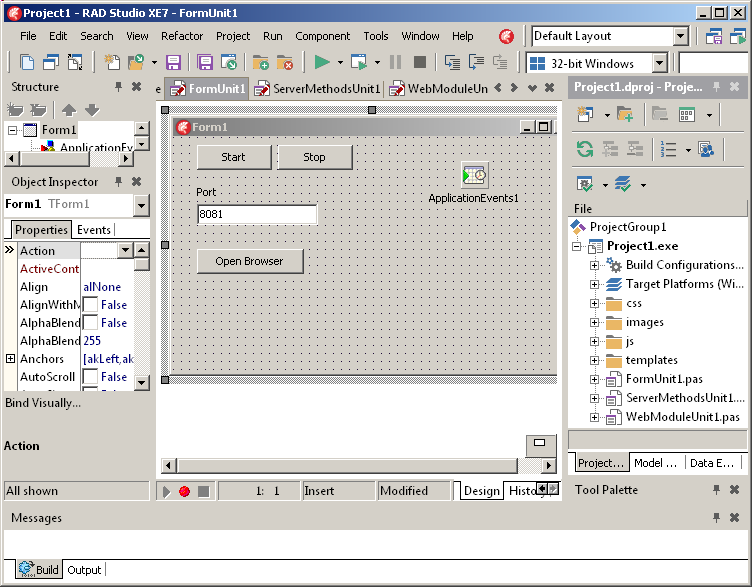 The goal was NOT to build a desktop application. 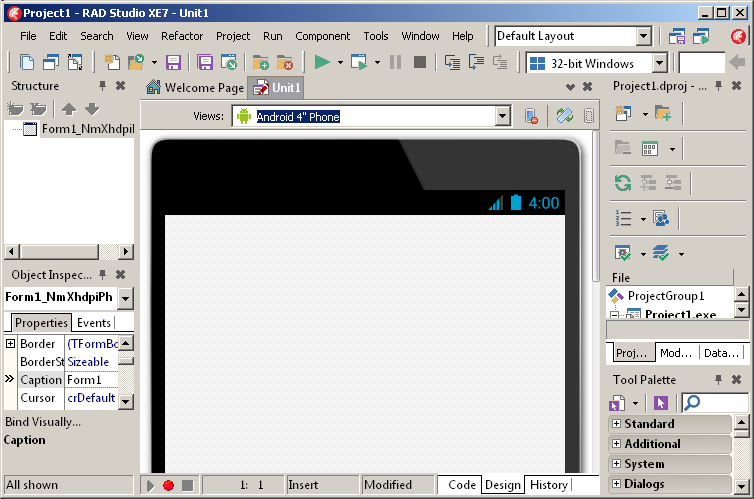 When the code was working as expected, we switched to the Android Platform. 5.1 - What's Next ? We presented the case of a simple table in read-only mode. finally a Business Object organization can simplify the Business Rules handling. We simply sketched the structure of a POS software. The detailed content of the applications depends on the specific application. It could be as simple as retrieving a list of products or as complex as a full fledged ERP. In the case of more complex software, the big applications like accounting or order processing would be handled on desktop PC's, not on mobile devices. Those PCs can still be connected via WIFI, an can use REST and FireMonkey. But the benefit is less obvious than for hand held mobile devices. Special congratulations to Delphi (Embarcadero ? Idera ?) for the two DataSnap wizards. Without them it would be nearly impossible to set up the REST Servers and Clients. Not only for the components and their links, but also for the generated code. 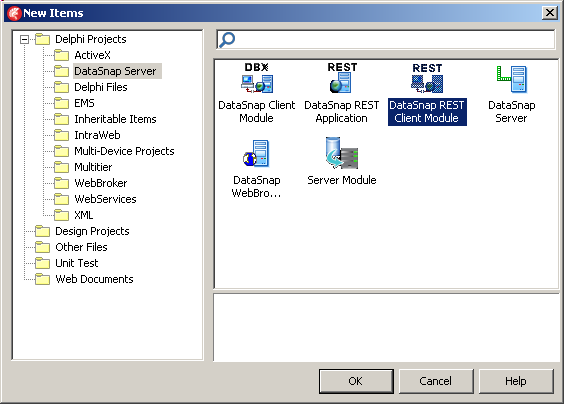 at run time, the Client works with the proxy, and the REST Client communicates with the REST Server to get information or other objects from the Server. 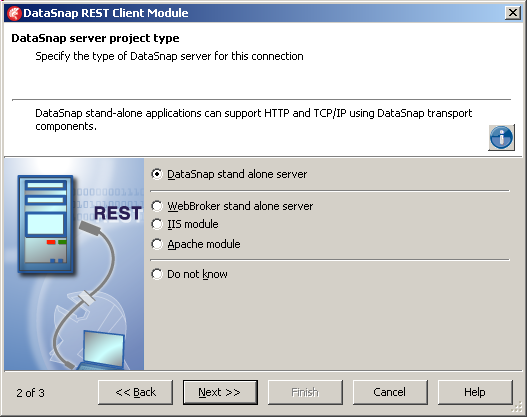 the code of the proxy was completely handled by the DataSnap framework. All we had to do was call the method to retrieve and instantiate the client proxy. We used a tDataSet object, and FireDac handled the marshalling using JSON. 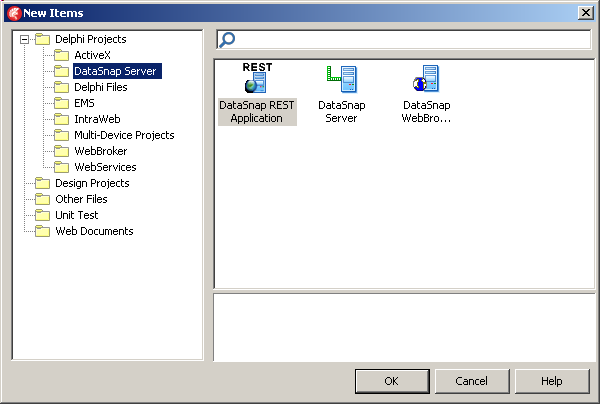 If we switch to Business Objects, DataSnap directly creates the proxies, and data can be exchanged using JSON. Could we add other buzzwords to our "Using FireBase, FireDac, DataSnap, Rest, Wifi, and FireMonkey" title ? No problem here, what about "Android, LiveBindings, JSON, FireUi, JNI, DHCP, WebBroker". Well, piling up buzzwords was not the objective of this paper, and does not guarantee readership. As this story demonstrates: a survey showed that the three best selling books were about Abraham Lincoln, doctors and dogs. So one feller wrote a book "Dr Lincoln's dog". Which was a total flop. we used Jim MCKEETH screen grabber Android Screen View. 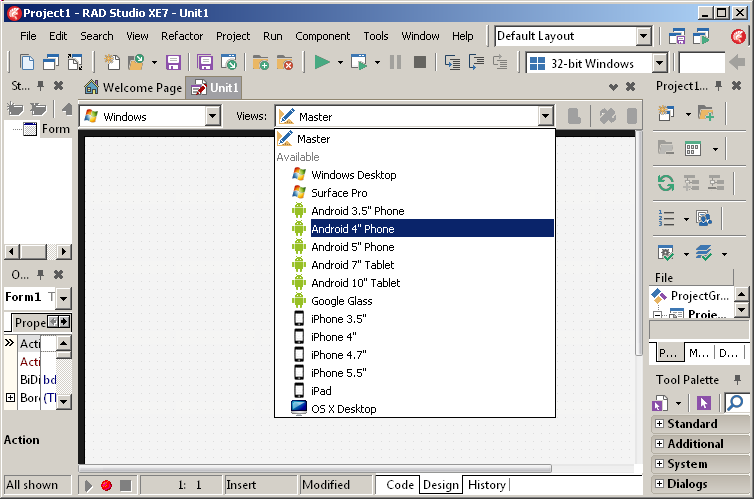 As explained in the "readme", it simply uses the ADB (Android Debug Bridge) to fetch the screen image and display in the grabber's Form. Whenever we had any Tcp / Ip problem, this is the man who always provided, in Embarcadero's forums or StackOverflow, an answer, usually with a piece of code which solved the problem.